&Stitches: Embroidery thread give away! As Nicole mentioned earlier, we've got another give away today! It's a colourful one. And a very essential one too: embroidery thread! Two sets of DMC perle cotton (size 8) to be more specific. 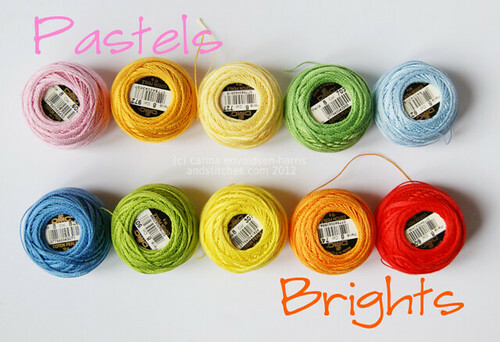 If you'd like a chance at winning some thread, simply leave a comment on this post telling us which set you'd like, pastels or brights. This give away ends on Thursday, Feb. 16, at midnight (CET). Please leave an email address so we can contact you if you're the winner. How gorgeous! I usually would go for the brights, but I saw the pastels and thought how gorgeous they would be for an Easter theme. So pastels it would be. What a wonderful giveaway! Thanks for the chance to win! i've never worked with perle cotton but i'd love to try it. i'd pick the brights over the pastels. brights, brights, brights, though to be honest I would be happy with either! What a fantastic giveaway! I would love the brights! Lovely! What a great giveaway. The pastels are gorgeous. Oh, brights!! Thanks for the chance to win! Goodness that's a hard choice but I think I'd settle for the brights! I love the brights! Thanks for the giveaway. Brights! These would be great for crazy quilting. Yes please! I'd choose the pastels! woot! they're both so pretty, but I'm going to step out of my comfort zone, step away from the pastels and say brights please! ohh lovely giveaway! I've surprised myself and love the pastel set the best. Ooh, thanks for the chance...love those brights! absolutely love them both...but i'll have to go with the pastels!! I used to make embroideries when I was a little girl. This would be a good chance to start again... I love bright colors!! Not a pastel kind of person so I would love a chance to win the brights!!! Ohhh, they are both beautiful! If I had to choose it would be the brights. Thanks so much for the opportunity!! Oh so pretty! Definitely the pastels! I'm currently giving my kitchen a vintage makeover and I would LOVE to win the brights. How fun would that be? Thank you for the chance to win. Oh wow!! They are beautiful! I'd love the pastel. What a wonderful giveaway! 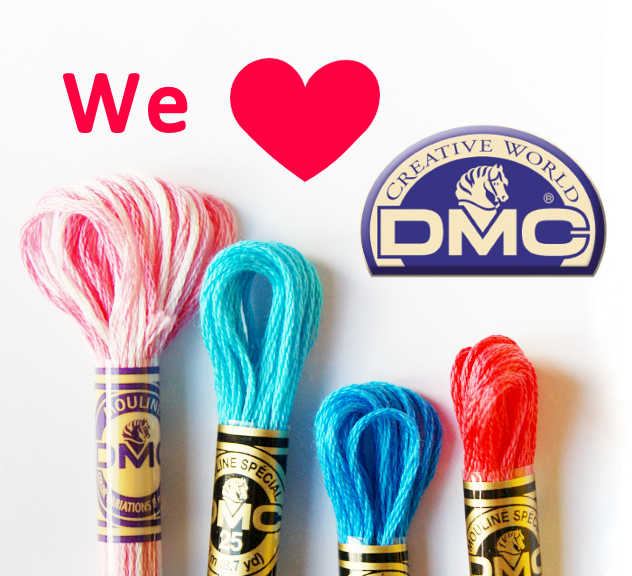 I have never used the DMC perle cotton (size 8) before. If I had a choice, it would be the bright colors. Thanks! Fabulous give away! Both are beautiful ... but I think the pastels would be great! Ooooh, lovely! I've been wanting to try perle cotton, and the pastels please me. That's a hard choice, but I think I like the brights better. wow, how wonderful! Thanks for the giveaway! Pastels please! The pastels are so pretty! What a great giveaway! No question about it - I am a brights girl - I have red pots and pans, cobalt blue dishes and my closet is filled with red and purple! Thanks for the awesome giveaway! I'd have to choose between brights and pastels??? Eeney, meeney, miney, moe... OK, brights. I want the brights. Brights like the lights in the nights. Knights that likes to fights knights in the nights with bright lights. Knights of rainbow goodness that fight with spite and pikes held tight. Oooh, I love the brights! Both are gorgeous but I think I'd get more use out of the brights. Thanks for the chance. I love those pastels!! I'd love a set of brights! I really like both, but would love the brights! I love the brights - especially the orange! What a lovely giveaway... and what a beautiful colors. Like? All of them, but especially the the pastels. Love them both! I think I'd go with the pastels, though. Brights,....or pastels..I think I'll go for the brights. Thanks for such a nice giveaway! The brights, always :-). Lovely giveaway!! If I win you choose for me - I love them all! Great give away, I'ld choose the brights ( I think LOL)Thank you for a change to win. Thanks for the chance to win this swell giveaway. I love the pastels, but I think the wonderful density of these colors are really effective in the brights. A big "wave" from Cape Cod! wow hard to choose they are both such great color sets! I would love either, but if I had to pick I want the pastels. Thanks for a great giveaway! Thanks for the chance to win. They are great colors, hard to choose one. If I have to, though, I'd go with brights. Yummy color collections, both of them! I'd go with pastels though if I was choosing. Thanks for the chance to win! They are both lovely but I would choose the brights if I had to. Thanks for hosting this giveaway!